My dog Teddy had a whole collection of stuffed animals and she knew them all by name and would bring them to you if you asked: Mr. Scruffles (the ugliest white cat you’ve ever seen), Simba (a lion of course), Simba Jr. (all the lions that followed as she wore them out), … Many of them had emergency surgery to make them last longer. Dogs love stuffed animals. How many of you have seen a puppy carrying around a stuffed animal almost as big as the puppy? 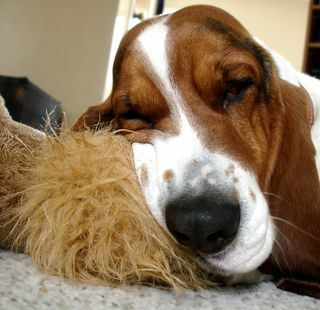 Many dogs like to play with stuffed animals, shaking, chewing and loving them. They also carry them around and use them as pillows while they are sleeping. Why? One theory is that dogs, especially retrievers, like carrying things in their mouth. Another is that they are practicing hunting when they shake the stuffed animals. I think they just like to play and collect toys like we do. If you give your dog stuffed animals be sure to watch how they act with them to make sure they are safe. Our dog Chase isn’t allowed any stuffed animals because he eats them immediately. If you don’t buy stuffed animals made for dogs, be careful to watch for pieces like plastic eyes and noses and styrofoam stuffing that can be chewed off and eaten. Ruth Bird suggests buying stuffed animals at garage sales cheap. I also found discount stores were a good place to pick up stuffed animals for your dog. ← Is it safe to give your dog a bone? My yellow lab/golden mix is 2 and chews up EVERYTHING! My daughter went through all of her stuffed animals and left the ones to be donated in a bin. Selah started picking out “babies” and carries them around. He doesn’t eviscerate them. May mouth them softly. Only problem is he kept going back to the bin for more “babies”. He finally had so many I told him child services said some babies needed to be returned. It is so cute to see. My dog loves his babies ( stuffed animals ) he has a routine when he gets a new baby first the eyes, nose and then the whole face is gone, it’s a no faced stuffed animal. I was worried I thought he needed a shrink the way he always went straight for the face. He knows which one he wants to play with and he stick with it tell he looses it god forbid he looses it, he drives me crazy until I find it. He use to eat the stuffing and material but not so much anymore. He won’t let me throw them away, he gets them from the trash. I have a jack-chi and I would die if anything happen to him he’s my baby.